Primorsky Krai joined the International day of sports. 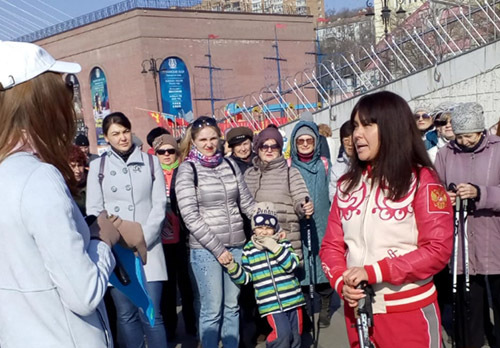 Several thousand Primorye residents from small to large came to the morning exercises and the international flash mob "White card" (White card), symbolizing honesty and a constructive approach to sports. As noted by the President of the Olympic Council of Primorsky Krai, Director of the Department of physical culture and sports Jean Kuznetsov, this wonderful sports festival performs an important mission. "It unites millions of people on all continents, promoting the ideas of Olympism and the values of fair wrestling. Such actions support children's and youth sports, contribute to the formation of a healthy and active lifestyle among young people and the older generation, but most importantly – give the joy of friendly communication and vivid impressions. It is encouraging to see that the residents of Primorye love and support the sport", – said Jean Kuznetsov. It should be noted that in Primorsky Krai for a number of years, events are held under the auspices of the Russian Olympic Committee, such as the all-Russian Olympic day and the winter sports Day dedicated to the winter Olympic and Paralympic games 2014 in Sochi, gathering thousands of sports fans and active and healthy lifestyles. It should be added that the development of mass sports, the creation of conditions for physical culture and sports, increasing the level of security of the population with sports facilities is one of the main goals of the regional project "Sport – the norm of life", implemented in Primorye within the framework of the national project "Demography".